Last month a sweet woman man named Francis (Mortifying: Francis sent me a note this morning correcting my mistake- tattoo was for daddy's arm all along. I had it all wrong.) emailed me to see if I would be interested in scrawling out her his daughters' names for a tattoo, and of course I eagerly said yes. 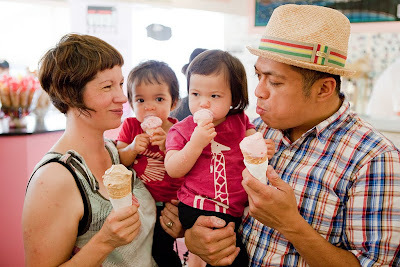 Here is the result (and a cute photo of the young family, to boot). One of the sweetest projects I've worked on in a while! That is the best thing I've ever seen. And, I don't even like tattoos!! That is so cool! What a lovely idea! beautiful calligraphy and a sweet tattoo! well, I must say that is really something! Thanks, everyone! So glad you like it! Wow! This is great. I've always toyed around with the idea of having my daughter and my husband's names done somewhere on me. beautiful!! that is really amazing!! brilliant. nicely done. if i were to get a tat, your handwriting would be a top choice. omgosh... this is just adorable! I love it! I wish David would stop saying he doesn't like tattoos. Gorgeous. I'm going to get back to you once I have a couple kids. that came out beautifully! i would love to have a tattoo in your handwriting. it makes for a gorgeous tattoo! would you ever consider doing that again for someone? Next please (my hand is raised in the air waving)~!!!! AWWWWW! That is just so sweet. awesome. well done to the both of you! And what an adorable family! I love this family & don't even know them! their flickr photos are so beautiful and the girls are about the same age as my little one, so it's been fun to keep up with them. Rad tatoo. so lovely! that's classy and tough and gorgeous all in one! this is beautiful, and so classy! i love it! oh my god! this is exactly what i have been looking for! i have been wanting to get a tattoo of my son's initals in a monogram style with this exact type of calligraphy! i want it to be very scrolly and feminine....i just love love love this! would you be interested in doing another? please email me and let me know! beautiful! I love the calligraphy! cannot get this image out of my head. such a lovely expression of love. I love this, brilliant Betsy! I've been keeping my eyes peeled at fonts forEVER trying to find one that's juuuuust right for the tattoo I plan on getting. this is IT. simple. unique. legible (lol). flowy...this is SO beautiful. i would LOVE to have you write mine...will you be taking more custom orders like this? Your calligraphy is beautiful! Would it be possible to contact you for a request? Thanks for loving the tattoo, everyone! You can feel free to contact me at betsydunlap@gmail.com if you have questions about getting one yourself! Oh my goodness. I've had something similar in mind for a long time (meaningful words though... not names), but could never find a font I liked well enough to have it permanently. I do have my daughters name tattoed onto my wrist too - and I love it. My name is Giordano and I'm from Brazil. My sister has just found your blog while surfing through the net and she absolutely loved the handwritting you made for this tattoo (http://bdunlap.blogspot.com/2010/01/lucy-orla.html). Is there any possibility for you to write a phrase for her to get herself tattooed? If yes, could you please send me an e-mail for us to talk more privately? The adress is giordanotc@gmail.com. I loved, I loved, I loved!!!!! Hi, my name is Marina, I'm from Brazil too. 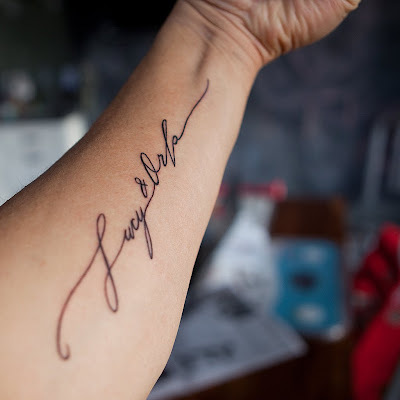 I saw a substance on this tattoo in a Brazilian magazine and I would like to tattooed my name with this font. You can write it for me with this font, please? And how much? I pay! I want it so much! olha eu gostei muito dessa tattoo e gostaria miuto que voce escrevese o meu nome e o nome da minha namorada para mim fazer uma omenagem para ela!! o meu nome e Thiago e o nome dela e Tanyane pode ser? that is just beautiful!! would you consider designing more tattoos? And congratulations for this amazing job !!! This is such an awesome idea!! Francis has exactly the right idea...in fact a couple of months ago, in the same spot on my arm, I got my sister's signature tattooed on my arm. I did this as a tribute to my sister who passed in October of 2009. Hey everyone! Thanks for your amazing response to this tattoo.....if you would like to talk to me about designing one for you, please just email me at betsydunlap@gmail.com and we can discuss! I also had an inconvenient with one of my tattoos I have, it was because I did the girlfriend's name on my arm, it was terrible because after that I broke down with her, then I had to change my tattoo. this is super unique and amazingly pretty! I'd LOVE to have something similar of my sons name! I saw this photo of tattoo on a French site and I like(it)! I would like be tattooed the first name of my children with this model of writing. Can you contact me if you agree? Thank you in advance. And then even at the expense of a really serious disease! I'm sorry, but something can and I will never understand! I'm borderline, for many years and when I then see that it is still an "art" makes me burst the collar! I liked to put name tattoo to my hip..
That is one of the most beautiful script tattoos I've seen! When I get up the courage to get mine done I may contact you! Hello there, I have fallen in love with the calligraphy handwriting you did for that tattoo at the top of your blog, and I was wondering if you could possibly do one for me? I have been searching and searching for a font i liked, and I LOVE yours. I want to get "Forever Young" done by your writing for my next tattoo. If you are interested, my private email is demonettes07@hotmail.com, just shoot me an email. Hi! I was hoping you could do a tattoo for me also! I want "Tu sei il mio sole" I've been looking for the perfect font for months now and I love your work! I like to have an Tattoo in my right shoulder but frequently i love to change it time by time..
ive been thinking about getting a tattoo now for 4 years.. and this font is what ive been looking for! the tattoo is to represent me leaving canada at 16 to live in the uk. Hi! I send you a email a couple days ago. I was wondering if you got it? Hi! My name is Sara Bailey and I absolutely LOVE love LOVE this font... could I possibly send you a phrase to write in this font (for a tattoo)?? If you could please email me at sepia.jane@gmail.com and let me know if this is possible! I've tried to contact you via email for a tattoo in this design but I'm not quite sure you received it. I'm very keen to get a tattoo in this font and I haven't found anyone that could get it right. Please let me know if you could design it for me if it's not too much trouble. My email is lyndanguyen@live.com. Thanks. So beautiful. I can't wait to get my rib piece done with this amazing calligraphy. Exactly what I wanted and have been asking artists to draw for me for over 2 years and no one can do it the way I want it. This is perfection. This is the most beautiful tat I have ever seen! How would I go about having you draw up a tat or two for me? Your work is stunning! I'm lost for words. You have such a wonderful elegant and unique font! She is really adorable.That is the best thing I've ever seen. Just now you, too, I wrote an e-mail, hoping that you have time loss and also to help me with my tattoo. I too have been looking for the right Srift, was itself creative, but that was more in the pants:-D. But now I came across your site and am intrigued. Not only that Tatto here, but all your work is enchanting. I would be incredibly happy to have your art on my skin!! I am absolutely in love with your handwriting. I have research tattoos for almost two years now; trying to decide what I want my first tattoo to look like and incorporate my style. This script is exactly what I have always envisioned! Is it at all possible to have something drawn up by you? If so, my email is cnunderwood@hotmail.com. I would be extremely grateful for your time and efforts! I absolutely adore this tattoo and I would love my first tattoo to be written in your hand writing. Is this at all possible? If so, I would greatly appreciate more information. My email is camabia@gmail.com. Thank you for taking the time! Hello, my name is Anne, i'm from Brazil. I am absolutely in love with your handwriting. I have research tattoos for almost two years, trying to decide what I want my first tattoo to look like my style. Your script is exactly what I have always envisioned! Is it at all possible to have something drawn up by you? I would be extremely grateful for your time and efforts. Hey there, I've noticed you've had about 100 requests for your handwriting for tattoos and I understand if you can't say yes to everyone... But I too would love for my kids names to be written by you for my next tattoo on my rib cage.. Probably all lowercase... Their names are .. I am in love with this calligraphy, and would love to use this style for a tattoo I'm planning! Do you accept payment for custom requests? I'm a big fan and have a tattoo idea... is there an email address I can discuss details with you through? I would love to have a tattoo with this font, so...if you can do it for me, I will be happy to pay for it! i love this! do you charge i want you are beautiful in this style? I Love this! What are the chances of getting this done up with my kids names? Simply Beautiful. I would be indebted to have you write out my daughters names as well Maddie&Mollie for a similar project. Could you find the time and energy to email me your details and cost? interested and waiting...thank you. I know you've had a million requests (!) but I so want to get my 2 babbas names tattooed on my wrist and I just LOVE this Lucy and Orla scribe and wondered would you write my kids names (Thaddeus and Grey) for me to show the tattoo artist? Would love to hear from you - my address is tamsinclee@gmail.com. Script is beautiful. How do we contact you to get some script done? Oh my gosh I've found you! I've been looking for this font to no avail and then it struck me it must be someone's original handwriting. I was so dissapointed and thought I'd never find out whose. I've had so many attempts at recreating something similar but for a tattoo that I'm going to have for life "good enough" just won't do! I know you have a gorgeous bubba to devote your time to now but if you could spare the time to email me either way I would be eternally grateful! Wow... so I have been searching for a font/script for a tattoo that I've been wanting for ages, and I saw the Lucy and Orla tattoo... I adore your writing, and would LOVE for you to write out the words for the tattoo I want. And obviously, I am not the only one. It is amazingly beautiful. Ifyou have the time, I would be so happy if you would contact me regarding this. I'll explain what I want, and the situation behind it. Thank you. Hello, I'm in love with your style of font and was wondering if you could please send me this style of script with the words;- "follow your heart?" I absolutely love your writing and would like to use it as the template for my first tattoo. This is beautiful! Would you be able to write "La vie est belle" with the L exactly like the one in this tattoo if possible? I am planning on getting this tattoo on the middle of my back along the spine. If you can, please email me at ctam11@gmail.com. thanks so much!! you really have an amazing talent! What a gorgeous font! I, like many people here, have been searching for 'the one'. (font - that is…:) I have spent countless hours browsing the net and nothing has excited me until now! Significantly enough, I am having the words ' no regrets' inked on my wrist as a reminder that there is no going back - no need to dwell on the past but only look forward to the future. Because of some life changing decisions I have made this past year, I must be positive; therefore, looking for a font that evokes a certain feeling, which this one most certainly does. I am sure you could make a fine business out of your calligraphic craft. As a graphic designer, I completely understand that nothing comes without a price tag when it comes to your artistic skill; however if you are interested in writing my words, please do get in touch and we could work something out. For while now I've been wanting a tattoo on my arm. After hours of searching and searching I finally found the perfect font on pinterest. Attached was the link to this website. Im really not even sure if you read these much less even see it. But I guess its worth a shot to try and ask. So I'm getting my tattoo next Thursday and id absolutly be forever greatful if you would be so kind as to write out my tattoo for me and email me a picture to take to the artist. I absolutely love this tattoo. I have been looking for something like that for quite some time. do you think you could help me with that? Hi, I absolutely love this font and I would love to have it for my first tattoo. It'd be awesome if you could email me and maybe draw a small quote out for me. My email is jackiefate@gmail.com it wouldbe awesome if I hear back from you! Can you write the names Juliana & Jake in this handwriting and I will go locally in NJ this weekend to get it done on my back??? I'll send you a pic after complete so you can share on your blog??? Pleaseeeeee I love love this. Email me at michg78@aol.com thank u!!! Would you be willing to do one for me to have tattooed? I love the look of this one. It would be of my daughter's name, Milana Lee.